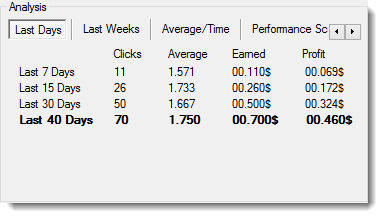 The Clicks History section shows the clicks records made by this referral. This section can be shown in two different display modes as illustrated below. 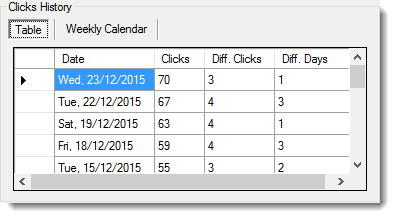 In this mode the clicks history is shown in tabular format. 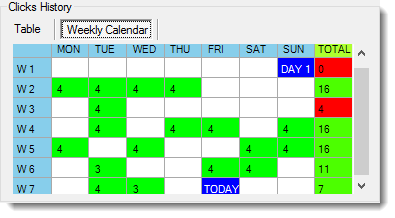 In this mode the clicks history is shown in weekly calendar format. 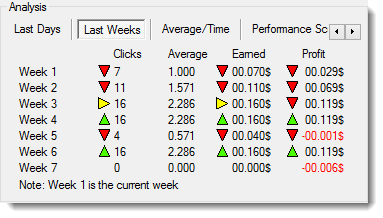 The Analysis section shows the clicks, earnings, average, recycling fees, and profit according to your rented referrals clicks performed in the past. The calculation takes into consideration day by day factors such as: clicks made by referrals each day, total number of referrals each day, membership effective costs, referral clicks commissions and extension discounts each day, recycling fees, and the extension. This section can be shown in two different display modes as illustrated below. In this mode the calculations are shown on the durations of last 7, 15, 30, 60, 90, 150, and 240 days from the starting day specified in the Analysis Settings. Each row has its own calculated clicks, average, earnings, and profit. There is option to show only the rows within the referral since duration and hide the older rows. In this mode the calculations are shown on each of the last 7 weeks including the current week which corresponds to Week 1. 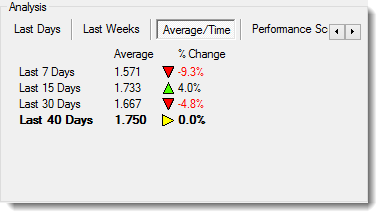 If the clicks, earnings, or profit on week is more than the previous week's week, there will be Green rising arrow shown beside it. And in opposite, there will be Red decaying arrow and so on. 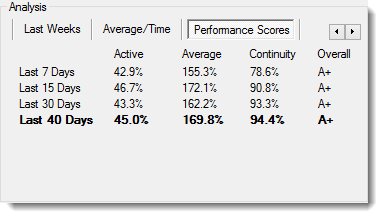 In this mode the average only is shown on the durations of last 7, 15, 30, 60, 90, 150, and 240 days from the starting day specified in the Analysis Settings. Each row has its own calculated average, and the % of change in the average compared to the next higher duration average. If the % of change is positive there will be Green rising arrow, if the % of change is negative there will be Red decaying arrow, and if the % of change is zero there will be Yellow neutral arrow.